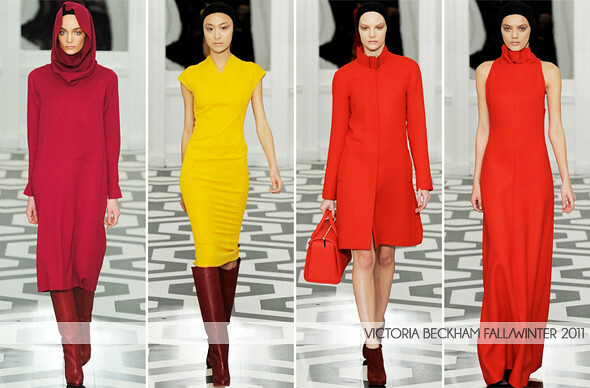 Victoria Beckham who is now pregnant with her fourth child presented her 6th collection on February 13, 2011 at New York Fashion Week. Former Posh Spice arrived in a cashmere oversized dress from her latest collection which has a hood/scarf— one of my favorite piece from the collection. Victoria Beckham arriving at her presentation venue wearing her own dress, sunglasses and Christian Louboutin ankle boots. Last season, she introduced bags.. this season, it's coats. Aside from that, the collection also consist of her 100th dress which was worn by Chinese model, Shu Pei. The greys, browns and military greens were my favorite in the collection. I love the idea of the scarf-like tops. It worked perfectly with the pencil skirts, not to forget the Christian Louboutin boots which was made for the collection. The head wrap with the belt does remind me of Andy's (Project Runway Season 8) warrior girl. Beckham also dabbled with pleating in the collection. The fabrics she used for the dresses and coats are stunning. 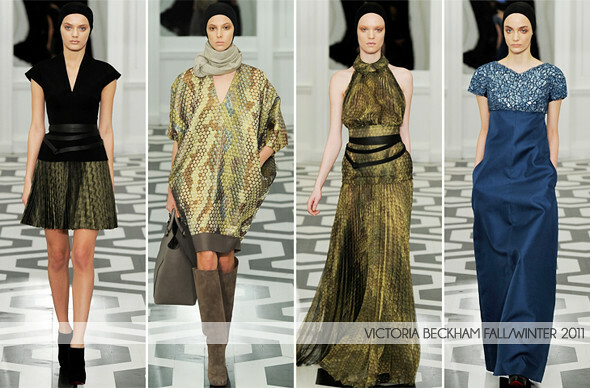 It was a beautiful collection, very well put together. But I don't love the pieces individually as much as her previous collections. I am glad she did not present a collection full of dresses. 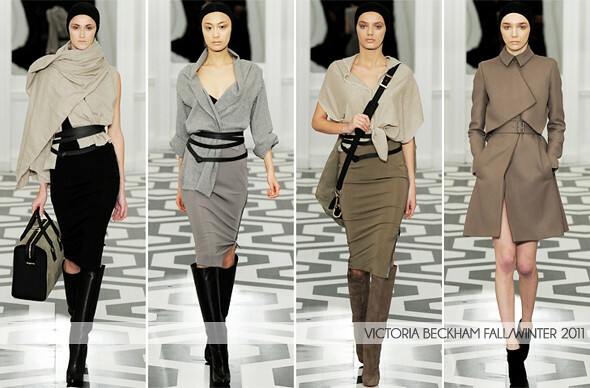 In the future, I hope she designs well-tailored blazers/suits since Victoria wears them a lot.